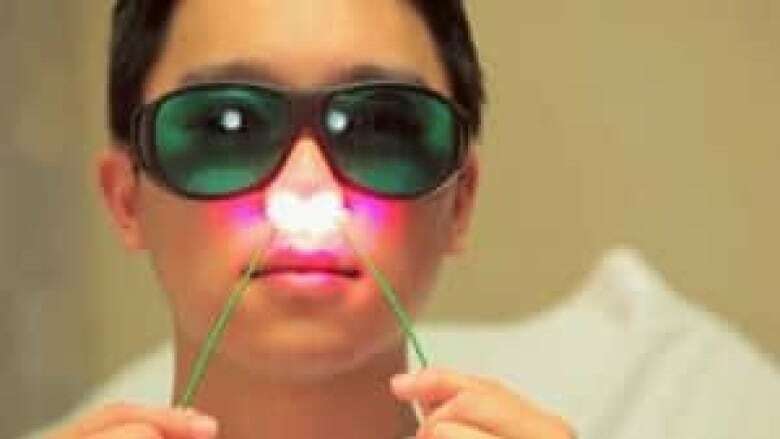 A project using light therapy to kill harmful bacteria reduced post-surgical infections by almost 40 per cent at Vancouver General Hospital, medical authorities say. Vancouver General Hospital says a pilot project using light therapy to kill harmful bacteria has reduced post-surgical infections by almost 40 per cent. The hospital reported Wednesday on the 12-month experiment using a process called nasal photodisinfection. "They have this treatment right before they go into the operating room for our high-risk surgeries and we've had a very high degree of acceptance by the patients," said Dr. Elizabeth Bryce, Regional Medical Director of Infection Control at Vancouver Coastal Health. Bacteria from hotspots on the body, especially the nose, can migrate simply by touch and cause an infection when patients are highly vulnerable, after surgery. "So if we can decrease the amount of bacteria in your body and in your nose, then we reduce your risk of an infection," Bryce said. Nasal photodisinfection involves applying a blue dye to the inside of a patient's nose before surgery. The dye attaches itself to germs and when a light is shone inside, potentially "bad" bacteria are destroyed. "Overall, we saved about $1.9 million. More importantly, we freed up about 550 patient-days and those patient-days we can use for additional surgeries," said Bryce, who noted that the project led to a 39-per-cent reduction in infections. The technology was developed by a Vancouver-based company, Ondine Biomedical. "Definitely 10,000, 20,000 people that are dying of hospital-acquired infections and we're hoping to take a big chunk of those and get them back into the land of the living and healthy," said Ondine CEO Carolyn Cross. Cross estimates that in B.C. alone, $90 million is spent each year dealing with preventable surgical-related infections in hospitals.